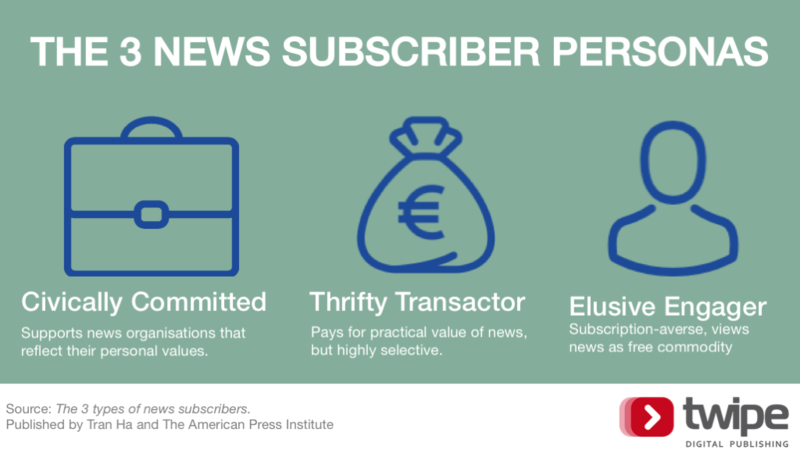 The Media Insight Project recently released the findings from the second phase of their research project to better understand what motivates news subscriptions. The biggest finding from this phase of the research project is the discovery of three news subscriber personas, each with their own distinctive mindset towards paying for news and strategy for converting to paid readers. The discovery of three news subscriber archetypes highlights the fact that there is no single revenue strategy that can apply to all audiences. To be able to better target readers, news organisation need to first be able to identify the potential subscribers and then understand what will motivate them to subscribe. For a clearer understanding of these archetypes, we went back to Reuters and Kantar Media’s Report studied few weeks ago about “Attitudes to paying for online news” and selected matching readers’ quotes for each persona. This segment supports news organisations that reflect their personal values and commit to a higher than average number of subscriptions. Civically Committeds are motivated to subscribe by feeling aligned with a news organisation’s mission, so to trigger a subscription from this group, it is important to promote the mission and values of the news organisation. This can be achieved also through partnering with volunteer and civic-minded organizations. It is necessary as well to create opportunities for real relationships and interactions, such as through events. Another small way to deepen the relationship with this segment is through sending thank you notes for subscriptions. The report elaborates that this segment of readers view their subscription as “giving to a friend”, so if a news organisation simply sends a receipt, they are missing the opportunity to make an emotional connection with the reader. This segments views their subscription as more than simply paying for content, but instead as a way to support the news organisation’s mission. To fully engage with this group, allow them to pay more than just their subscription, by “donating” to the cause. Millennials who are “Civically Committeds” are a particularly valuable segment that publishers should prioritise. This segment pay for the practical value of news, but are highly selective about which publications make the cut. Thrifty Transactors are practically minded, so to earn a subscription from this group, the news organisation needs to add direct value to their lives. Certain publications are more likely to have Thrifty Transactor subscribers, such as The Economist, Wall Street Journal, and Harper’s Bazaar–all publications that focus more on a niche area than being ‘newspapers of record’. Local coverage done well can also count as the highly relevant “speciality” that this news subscriber is activated by. Thus to reach this segment, it is of particular importance to provide in-depth coverage in key areas, and not simply adequate coverage of many areas. One way to benefit from this, is to offer limited subscriptions to verticals–such readers are more willing to pay a lower price for a smaller amount of just the content they need. This segment is generally subscription-averse and view news and information as a commodity that’s easily obtained for free. One blocker many Elusive Engagers listed was the fear that once they subscribed, it would be difficult to stop the subscription. As such, they are much more comfortable with one-off, no strings attached transactions. To reach this group, it is important to offer one-time payment options, even allowing them to pay for a month of access with no recurring subscription attached. Also, it is important to make it easy to cancel, and highlight that up front. This alone won’t be enough to trigger all Elusive Engagers but it will help you to win some of them over. Furthermore, it is possible to monetise their loyalty is different ways. Elusive Engagers do want your content, so you can insist they turn off ad-blockers, encourage them to come to events, or market other products to them than the news subscription (books, e-commerce, and third-party paid promotions for example). This is the exact audience that would benefit from the addition of a ‘Playwall’ which allows readers to pay for digital content with their opinions, rather than with money. In addition to discovery of the three news subscriber archetypes, there were a few other key findings of how to trigger subscriptions in general. Clear subscription proces: a frustrating subscription experience, whether it is a free trial gone wrong, unwanted correspondence, or a difficult cancellation process, has a lasting effect that makes many readers wary of future subscriptions. To combat this, make it clear up front how subscribers can cancel. Leverage familial ties: publishers can better leverage familial tradition to grow subscriptions among new and younger readers. For example, offer family discounts in which additional family members can begin a subscription at a lower price (more than just the common digital access that is given for families now). Focus on a few topics: to rise above the noise, it is better to focus on a few key areas of coverage, instead of attempting to be equally comprehensive about everything. This aligns with the strategy of reaching Thrifty Transactors, but also with reaching the other personas, by showing why your news organisation is different than others covering the same topics or in the same geographical region. Broaden your definition of local: in this digital age, local is more than just the geographical bounds publishers commonly define as their coverage. A local audience often includes people who no longer live in the area, but have a meaningful connection to it. Understand that mode of news consumption is not an innate preference: often the primary medium of news consumption has been viewed as an innate preference, not something driven in part by circumstances. But this study found that media consumption habits can change based on life circumstances, and even go against previously stated preferences. This entry was posted in Industry news and tagged Digital publishing, Digital Strategy, digital subscribers, Monetization, Paid Content, subscriptions. Bookmark the permalink.